← The Climate In My Hometown. She achieved two remarkable things with that one comment. She made a BFF out of me and more importantly out of my daughter in law Manjiree as well! Arvind has got the largest collection of our family photographs having had my late mother living with him the longest and having hijacked my late father’s collection of photographs from my home when my father was spending his last days with me. He chose this photograph to share in our family group mail to remember Dr. Kumaraswamy’s connection to us. Dr. K, just short of a hundred years old passed away on the day before this photograph was shared by Arvind. 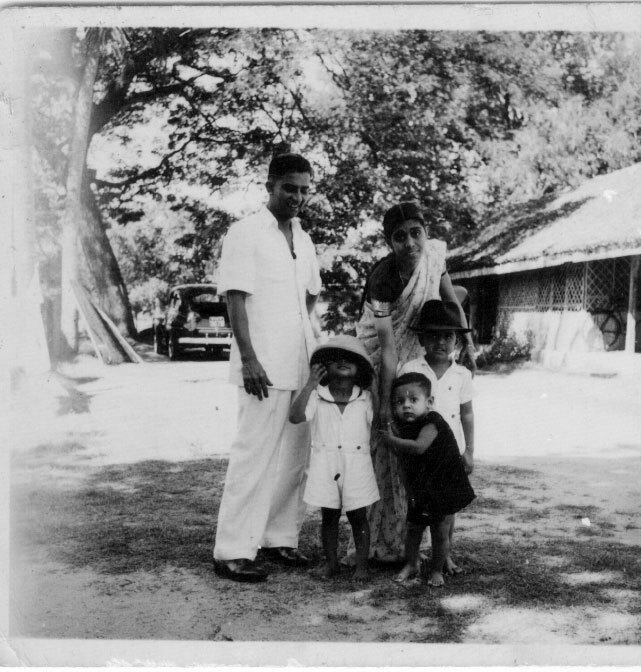 On seeing this photograph, Manjiree wanted to know if the three young lads were the famous three handsome musketeers of the family! I suspect that she needs new prescription for her glasses. They are more like three mosquitoes. And her question again almost made me take off on a soliloquy about the characters in the photograph, the car there, the headwear, the house seen on the right of the picture and the reason for the solar topi and so on and so forth, but refrained from doing so, so that I could share it with Cheerful Monk and my other readers if they will be interested in such a soliloquy. This entry was posted in Blogging, Family, Nostalgia, Relationships, Writing and tagged Felt hat, Ford V8, Solar Topi, Three musketeers. Bookmark the permalink. Of course we will be interested! And I’m honored by your post. Thine wish is mine command. yes we would be interested! but i’m certain… so will manjiree! though at least she will be able to read it with the rest of us. Yes, she reads all my blogs and comments personally to me and also questions me further on anything that may intrigue her in them. I shall not disappoint you Rasheedbhai. I shall not disappoint you Anna. I have a friend who has “three monkeys” – although they are now teenagers so I’m not sure they would like to think their Dad thought that…. Mosquitoes not better than monkeys? Oh, yes. Please do. I already am eagerly awaiting some details about solar topis (including why they no longer are referred to as pith helmets). You won’t have to wait for long, I assure you. As I write this, the first instalment is live.